12 Kms. from Airport, 5 Kms. from Railway Station. 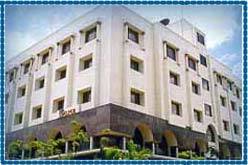 Hotel Shelter is situated in close proximity to the major business houses of the city. Shelter hotel is the only one of its type of business Class Three Star Hotel in the historical Mylapore, Built aesthetically and staffed with dedicated hospitality professionals. Hotel Shelter provides a good option for economic business travelers and tourists, Hotel Shelter has all the modern conveniences and necessities to suit the needs of a businessmen. Its a unique business hotel. Hotel offers guests with centrally air conditioned rooms with individual temperature control for personal satisfaction. Apart from the basic facilities in the hotel, guests also have a host of other facilities in there reach. The rooms in the hotel are comparitively larger than the other hotels and have been designed to provide guests with comfort that is uncompareable to other hotels. H/C running water, Telephone, T.V., Channel Music, 24 Hour Coffee Shop, Money Exchange, Laundry, Room Service, Internet Access, Travel Desk, Shopping arcade, Room Service, Doctor on Call, Laundry, Money Changer, Fax, E-mail, Internet access, Safe Deposit, Travel Desk, Postal Services, Doctor On Call, Safe Deposit, Cafe Expresso, 24 Hours Coffee Shop, A Multi-Cuisine Restaurant, Poker, A Well Stocked Bar, Air-conditioning, Bathroom Amenities, Wake Up Service/Alarm-clock, Working desk, Seating Area.